Pressure Decay - Zaxis Inc.
A pressure decay test evaluates if a part is leaking air. Whether you are manufacturing medical catheters or fuel injectors it is important that your parts do not leak prior to selling to the public. Typically manufacturers will have a variety of different quality systems in place to ensure their parts do not leak. Some manufacturers will either dunk their part or product in water, known as a dunk test, or build their own leak tester. We recommend neither of these processes as they can be time consuming and yield a high degree of uncertainty due to their variability and/or human error. Zaxis’ pressure decay testers are much more efficient and accurate. 1. Connect your part to a Zaxis leak tester with a fitting or fixture. During the FILL stage your part is pressurized. 2. Once the desired test pressure specified by the manufacturer has been reached and the fill time has ended, the SETTLE stage commences accommodating for part stretching or flexing. 3. Once the part has settled and the settle time has ended, the pressure decay TEST initiates. During the test stage a pressure sensor will measure any drop in pressure. 4. After the pressure decay test the remaining pressure in the system is vented to atmosphere during the VENT stage. 5. If the pressure decay of your part remains within your specification then your part PASSES and a green light illuminates. 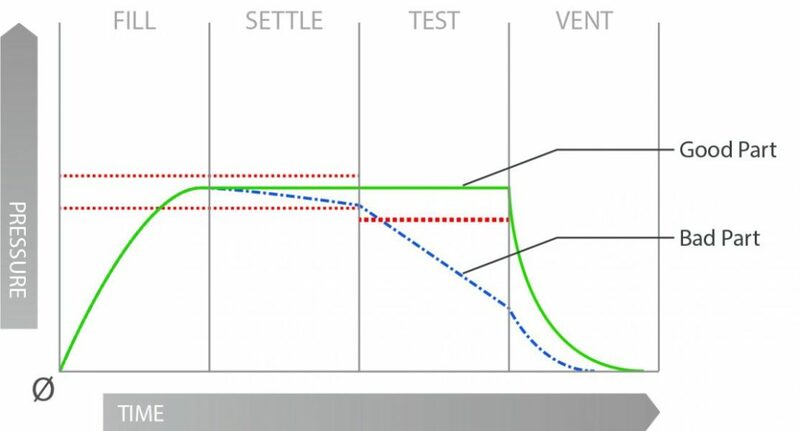 If the pressure decay of your part falls below your lower limit, then your part FAILS and the red light illuminates. To learn more about pressure decay visit our downloads.